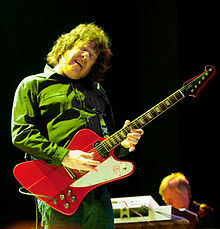 Robert William Gary Moore (4 April 1952 – 6 February 2011) or Gary Moore, was a musician from Belfast, Northern Ireland. He was a blues rock guitarist and singer. On 6 February 2011, Moore died in his hotel room in Estepona, Spain of a heart attack. ↑ "Rock guitarist Gary Moore dies". BBC. 6 February 2011. ↑ "Former Thin Lizzy guitarist Moore dies". IrishTimes.com. 6 February 2011. Retrieved 6 February 2011. Wikimedia Commons has media related to Gary Moore. This page was last changed on 20 June 2018, at 03:07.